Rumours that Mr Xi was a market reformer appear to have been exaggerated; he has focused on asserting China's leadership on the world stage. 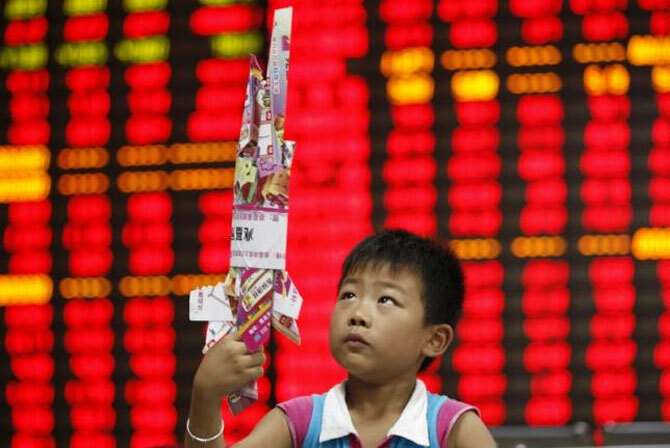 The Shanghai stock market may have lost over 15 per cent on Monday and Tuesday alone, but what the Communist leadership in Beijing has lost in the past few weeks is much costlier: it has squandered a great deal of credibility. Having encouraged retail investors to pile into the market from last summer through editorials in state-owned media, the government had tried to fight the sell-off after its devaluation by spending as much as $200 billion in the stock markets. In that sense, the sharp drops in the market over the past couple of days are actually good news as they are a signal that the government, having learned the hard way, is now content to let the stock market sell-off run its course without trying to intervene. Anyone hoping for forthright talk from the leadership would be disappointed, however. Premier Li Keqiang did issue a statement on Monday, but it was on the growth prospects of the 3D printing industry. Such decidedly confusing messages are becoming part and parcel of the politics of President Xi Jinping and his senior leadership. A battle against widespread corruption has increasingly seemed fundamentally directed at neutralising Mr Xi’s rivals in the party and the army. A fortnight ago, the internecine rivalries within the Communist Party unusually spilled over in to the People’s Daily, which warned that retired leaders should not interfere in politics. This was a reference to former president Jiang Zemin and his allies, two of whom, senior retired generals, have been victims of the anti-corruption campaign. An aide of Mr Xi’s immediate predecessor, Hu Jintao, and the former security chief have also been charged with corruption. China, like India, is riddled with corruption, so these people may even have been found guilty by a fair trail, but it is all looking like a vendetta rather than genuine reform. While Mr Xi plays politics at home and abroad (where China has shown a new aggressiveness in raking up disputes with its neighbours), his erstwhile economic reform agenda - to massively reduce the role of state-owned enterprises that dominate sections of the economy, deregulate markets and price capital correctly - has foundered. On Tuesday, China cut deposit and lending rates and reduced reserve ratios for banks to stimulate the economy. In retrospect, rumours that Mr Xi was a market reformer appear to have been exaggerated; he has focused on asserting China’s leadership on the world stage. In the past few weeks, however, doubts about the regime’s ability to respond to a financial crisis have become widespread. Still, on Tuesday, investors in Europe and the US appeared to be taking the bloodbath on the bourse in China in their stride. One commentator pointed out that, as the world’s largest net exporter, the world matters more to China than China matters to the world – unless you are a commodity exporter like Brazil, Indonesia and Russia. Slower export growth for India, however, is certain as Chinese exporters become even more competitive against their Indian counterparts. Senior officials in India sounded platitudinous in response to the plunge in Chinese share prices - speaking of it as “an opportunity” for India, which looked a “safe haven” by comparison - and seemed almost as distant from reality as Premier Li did when he spoke of opportunities for the 3D printing industry. Make no mistake: when a giant like China trips and falls, emerging markets across the world get hurt.